The Jewish community of Kinshasa within the Democratic Republic of the Congo joined Rabbi Shlomo Bentolila, Head Shliach to Central Africa and the Talmidei Hatmimim of Yeshivas Ohel Moshe Chabad to celebrate the onset of Chanukah with a public Menorah lighting held at the Beth Yaacov Synagogue and Regional HQ of Chabad Lubavitch of Central Africa. Rabbi Shlomo Bentolila spoke on the message of Chanukah and its relevancy today, especially in light of the recent terror attacks in Kenya just a few months ago. Rabbi Bentolila reminded everyone present of the message from the Lubavitcher Rebbe, Rabbi Menachem M. Schneerson of blessed memory, how bringing in just a little light, can dispel much darkness and how each every Jew has the ability to be a lamplighter to bring the light of Torah and Yiddishkeit to all. In that vein, he announced that two Rabbinical students had already arrived from New York to Accra, Ghana and presented the list of cities where further Chanukah celebrations will be hosted by students of the Yeshiva throughout the remainder of Chanukah. Within the Democratic Republic of the Congo, Bachurim will be traveling to Kolwezzi and Lubumbashi, to Brazzaville and Pointe Noire in the Republic of Congo, to Rwanda and to Nairobi,Kenya. Additionally, many Menorah lighting's and Chanukah events will be taking place in Abuja and Lagos, Nigeria under the direction of the local Shluchim, Rabbi & Mrs. Israel Uzan. The New Year 5774 is upon us. Let us pray that it be... A Year of Change, A Year of Hope, A Year of Jewish Education, A Year of Israel celebration, A Year of inspired Jewish Living, A Year of Promise, A Year to Dream. At Chabad of Central Africa, we are continuously working to makes these prayers reality. Over the course of this Holiday season, Rabbinical students and emissaries have been dispatched to Lagos, Nigeria; Windhoek, Namibia; Accra, Ghana, Brazzaville and Pointe Noire, Congo Republic; Malabo, Equatorial Guinea, and Freetown, Sierra Leone; in addition to our full time presence in Abuja, Nigeria and our HQ in Kinshasa, Democratic Republic of the Congo. We simultaneously continue to offer relevant, accessible, and meaningful resources and inspiration to other Jewish individuals and communities, warming the lives of thousands of Jews throughout Sub-Saharan Africa. Later this month, ten new Rabbinical students will be arriving in Kinshasa for the third consecutive year to further help expand our outreach efforts throughout the year. Towards this end, I would like to ask you for your partnership in our work, with your generous gift to our yearly budget. Our Mission is huge and costly, and with your help, we can do even more. Help make these dreams a reality, Today. May your generosity generate divine blessing for a prosperous, healthy, and illuminated year, materially and spiritually. P.S. With the new year upon us I invite you to browse through our all new website www.JewishAfrica.com! 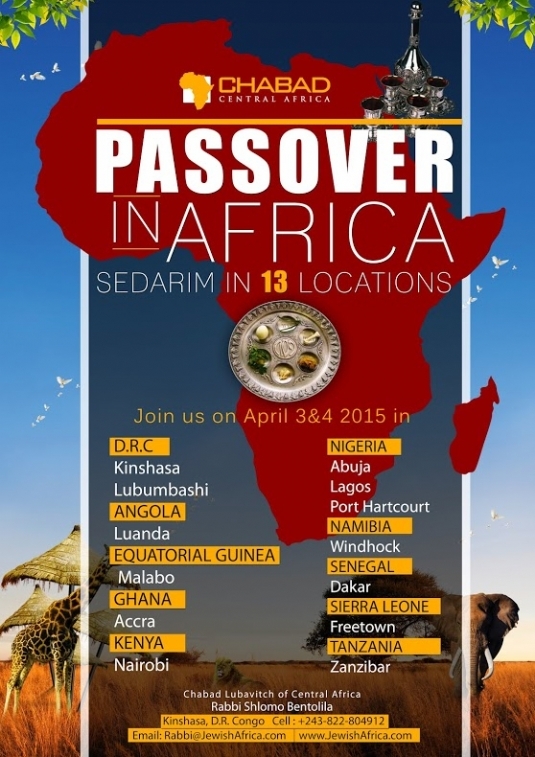 Chabad-Lubavitch of Central Africa, under the leadership of Rabbi Shlomo Bentolila, in cooperation with Chabad-Lubavitch World Headquarters, are dispatching groups of Rabbinical students to the Sub-Saharan African Region, to once again help organize the traditional Passover Seder programs and enhance the spirit of the ‘Exodus’ amongst the Jewish residents, expatriates, dignitaries, and visiting businessmen. Students from the Rabbinical College of Kinshasa will be joined by their colleagues from Johannesburg, South Africa and from New York to lead public community Seders in 1) Kinshasa, DRC 2) Pointe Noire in the Congo Republic 3) Lagos, Nigeria 4) Abuja, Nigeria 5) Windhoek, Namibia 6) Accra, Ghana, 7) Malabo, Equatorial Guinea, and 8) Freetown, Sierra Leone. 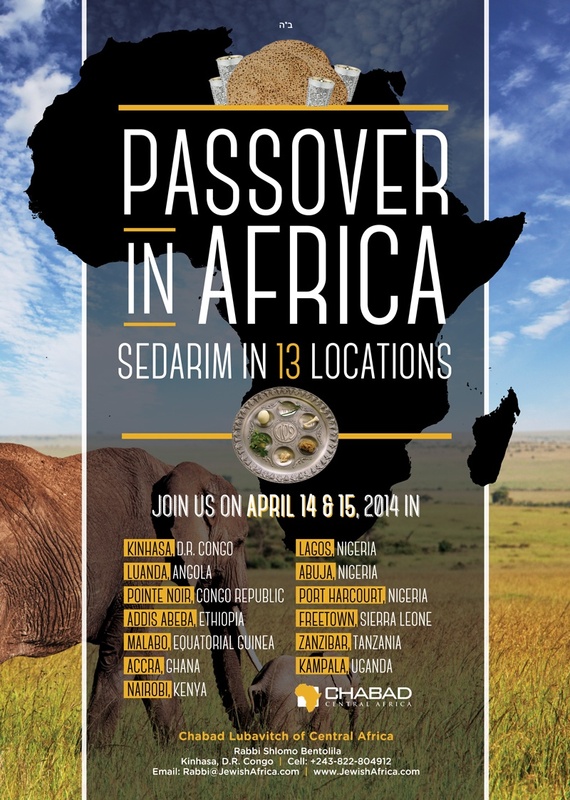 Other community Seders will be hosted by local communities in Kenya, Ethiopia, Gabon, Rwanda, and Uganda. Jewish children across Central Africa will participate in "hands-on" Model Matza Bakeries where they will bake their very own hand made matzot as well as many other Arts & Crafts and other educational programs surrounding the theme of Passover. Additionally, Jewish children in Nigeria will benefit from a special Jewish Day Camp experience hosted by our local representatives, Rabbi Israel and Haya Uzan with the assistance of some of our Rabbinical students. All Jewish residents and businesses in Central Africa are asked and encouraged to sell their "Chametz" by clicking here and completing the form no later than Thursday evening, March 21, 2013 in order to enable us to sell the Chametz in time (Monday morning March 25th) in observance of the Code of Jewish Law. Please click here for a ENGLISH | FRENCH | HEBREW link to the Laws and Customs of Passover, times for stopping to eat and burning of the Chametz, Candle lighting times, Yizkor observance and all other issues related to the Passover Holiday. For any other questions, please do not hesitate contacting Rabbi Bentolila at the telephone and email below. Welcome to our newly designed and totally revamped website. With so many new happenings here at Chabad of Central Africa, such as the newly established Yeshivat Ohel Moshe - Chabad, our expanded Rabbinical Peace Corps and Roving Rabbis programs visiting up to 14 other countries in Central Africa throughout the year, and so much more, we felt the need to renew our site and make it more user friendly and enjoyable for our visitors and readers. Most importantly, we wanted to give you the opportunity to share your thoughts and concerns and comment on our Blog page. The site is not yet complete as we are updating individual pages one by one. Please visit our site, browse through our recent albums, read our new articles and provide us with your thoughts and comments. Please also subscribe to receive our monthly e-newsletters and to be put on our list to receive new publications such as the upcoming New Year calendar for 5773 and Holiday guides. You can also join our Facebook page and get immediate updates. Chabad-Lubavitch of Central Africa, under the leadership of Rabbi Shlomo Bentolila, in cooperation with Chabad-Lubavitch World Headquarters, are dispatching groups of Rabbinical students to the Sub-Saharan African Region, to help organize the traditional Passover Seder programs and enhance the spirit of the ‘Exodus’ amongst the Jewish residents, expatriates, dignitaries, and visiting businessmen. 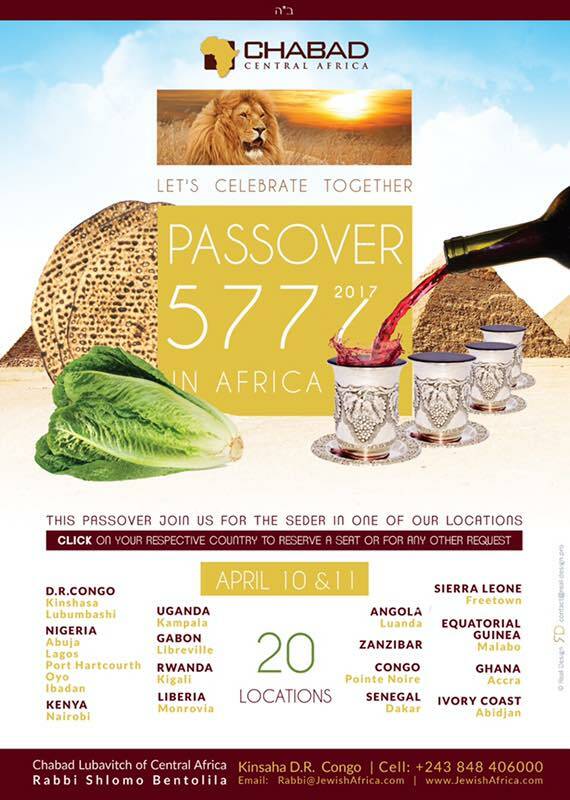 Community Seders will be held in 1) Kinshasa 2) Lubumbashi, DRC 3) Brazzaville 4) Pointe Noire in the Congo Republic 5) Lagos 6) Abuja, Nigeria, 7) Windhoek, Namibia 8) Accra, Ghana, 9) Malabo, Equatorial Guinea, 10) Luanda, Angola 11) Freetown, Sierra Leone. Jewish residents in Benin, Bostwana, Burkino Faso, Burundi, Cameroon, Cote D’Ivoire, Ethiopia, Gabon, Gambia, Guinea, Kenya, Liberia, Mali, Malawi, Rwanda, Sao Tome & Principe Islands, Senegal, Somalia, Togo, Uganda, Zambia and Zimbabwe looking to join and participate in a local program, can contact Rabbi Bentolila at rabbi@jewishafrica.com. Jewish children across Central Africa will participate in "hands-on" Model Matza Bakery where they will bake their very own hand made matzot as well as many other Arts & Crafts and other educational programs surrounding the theme of Passover. All Jewish residents and businesses in Central Africa are asked and encouraged to sell their "Chametz" by clicking here and completing the form no later than Thursday evening, April 5, 2012 8:00 PM (Local time DRC) in observance of the Code of Jewish Law. Please click here for a link to the Laws and Customs of Passover, times for stopping to eat and burning of the Chametz, Candle lighting times, Yizkor observance and all other issues related to the Passover Holiday. For any other questions, please do not hesitate contacting Rabbi Bentolila at the telephone and email below. Students from the Democratic Republic of the Congo’s newly established rabbinical school spread out across central Africa over Chanukah to connect with area Jews and a cluster of communities throughout the continent. 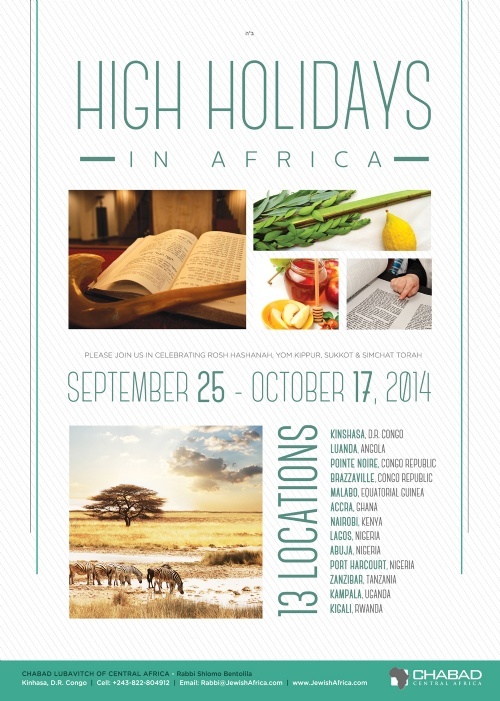 Traveling by boat and plane to Equatorial Guinea, Ethiopia, Namibia, Gabon, Pointe-Noire and Brazzaville in the Congo Republic, and Nairobi and Mombasa in Kenya, they hosted public menorah lightings and holiday events throughout the region with the backing of Chabad-Lubavitch of Central Africa. Rabbinical student Benjamin Bentolia, who traveled around the Congo over Chanukah, lit candles with residents and spoke with them about both the holiday and Judaism in general. Like his seven fellow rabbinical students, Bentolila was there to help those he came in contact with learn and help them connect with the holiday’s traditions. The goal was to meet other Jews and share with them ways Judaism can help improve their lives, and to inspire them to do as many acts of goodness and kindness as possible. Many of those he met were Israeli and French, with some working in the agriculture, fishing, diamonds or construction industries. In Pointe-Noire, he said by way of example, the community just built a synagogue in the home of a religious Israeli Jew, though it doesn’t yet have a Torah scroll. And in Brazzaville, there are a group of Israelis that gather for the Sabbath. “There’s no synagogue, but they just try to keep as much of Judaism as they can,” related Bentolila. The students received warm welcomes, he said, adding that they spent the week handing out menorahs, which residents were happy to get, and helping Jewish men don the prayer boxes known as tefillin. In nearby Namibia, Dovie Aizenman was busy setting up a circumcision for the grandson of a Cuban businessman he had met, whose grandson lives in Mexico and hadn’t yet had one. “Hopefully we’re going to celebrate a bris in Mexico,” he said. Aizenman also met a man who didn’t know he was Jewish until they started chatting randomly on the street. The encounter will lead to a Bar Mitzvah celebration for the man at his home. Other unexpected connections included meeting a traveling family from Sydney, Australia, that was invited to a Chanukah party, an elderly Russian Jew who had never put on tefillin, and an elderly woman who said she never imagined she would be sitting in Namibia with so many people at a Sabbath meal. A Mezuzah on African Hospital? How did Central Africa Shliach Shlomo Bentolila end up putting a Mezuzah on one of the most advanced hospitals in West Africa? Rabbi Shlomo Bentolila, Director of Chabad-Lubavitch of Central Africa, was honored with inaugurating the new building of the La Paz Medical Center, one of the most sophisticated and advanced hospitals in West Africa. With the hospital's staff around him, the Chabad Shliach made a blessing and affixed a Mezuzah on the hospital's front door. This news is no surprise for those who know the dynamics of Equatorial Guinea, a former Spanish colony, which is considered one of the most poorly-run states of western Africa. The driving force behind the medical center in the port city of Bata is an Israeli citizen called Yardena Ovadia. The businesswomen is said to have close ties to the country's President Teodoro Obiang, who has ruled the country since a coup in 1979 and is the Chairperson of the African Union. Ovadia is said to have persuaded Obiang and GE Healthcare International to build the state-of-the-art medical center, which employs a large staff of Israelis. According to Haaretz, she grew up in the hardscrabble Negev city of Dimona, Israel, and first visited Equatorial Guinea several years ago and formed a friendship with President Obiang. Rabbi Bentolila, who from his base in The Congo has been looking out for and assisting Jewish communities, visiting businesspeople and expats in Central Africa, was invited to the inauguration ceremony. With his distinct chassidic look, he praised the humanitarian work and medical assistance that is given at the hospital, blessing that the healing angel Refael will be with the doctors and nurses. Yaacov Behrman blogs about the time he spent touring Kenya while the African country was fighting al-Qaeda-linked Shabab militia. A hundred years after the Kenyan Jewish community built their first synagogue in Nairobi, I celebrated Sukkot there. I was planning a trip to Kenya with some colleagues anyway. Rabbi Shlomo Bentolila, Chabad representative to Central Africa, asked us to stop on the way and spend the first days of Sukkot and Shabbat with the community in Nairobi. Jewish settlement in Kenya dates back to 1903. As a proposal for a Jewish homeland, British Colonial Secretary Joseph Chamberlain offered Theodore Herzl 5,000 square miles of the Mau Plateau in what was then Uganda. The land has since become part of Kenya. The World Zionist Organization sent a delegation to scout the land. The observers returned and reported that the land is filled with dangerous wildlife. They also informed the Zionist Organization that the Maasai tribe (a large number lived in the proposed homeland) were opposed to an influx of European Jews. In 1905, the Zionist Congress voted against the idea. Some Jews decided to move to Kenya anyway but settled in more urban areas. In 1912, sixteen Jewish men built the first Synagogue in Nairobi, Kenya. Currently, the synagogue is a beautiful structure located on a huge compound in the center of Nairobi. A splendid garden takes up most of the compound. Though Nairobi seems pretty safe, Kenya is no stranger to terrorism. In 1998, the US Embassy was bombed. A few years later, in 2002, terrorists attempted to shoot down an Israeli passenger plane. Within minutes of the missile attempt on the plane, terrorist crashed a car bomb into the Jewish owned Paradise Hotel in Mombasa. So security is tight. The entire compound is surrounded by a concrete wall. The only entrance into the property is well guarded by armed officers. Services are held weekly on Shabbat and Jewish Holidays. Approximately twenty five members attend synagogue on a regular basis. The High Holidays draw over a hundred. We left Nairobi Sunday morning and headed for the Maasai Mara. We drove along unpaved roads zigzagging around potholes to avoid getting stuck and stranded. There's no AAA to call if that happens here. Not for the faint-hearted, who are better off flying. We spent three days in the Mara. The accommodations at the Simbo lodge were excellent and the kitchen staff worked overtime to ensure we had kosher food. They even allowed us to set up a sukkah near the eating area. On the first day of our Safari, in response to numerous kidnappings on the Somalia border, Kenyan forces entered Somalia to push back the al-Qaeda-linked Shabab militia. If not for the one TV screen in the lodge lobby, we’d have never known the country was at war. Before we left, the manager thanked us for coming to Kenya during these troubling times. The lodge received many cancellations because foreign countries issued warnings against travel to Kenya. He smilingly told us that the Israelis aren't cancelling. Even more, he told us happily, are coming now because of cheaper prices. 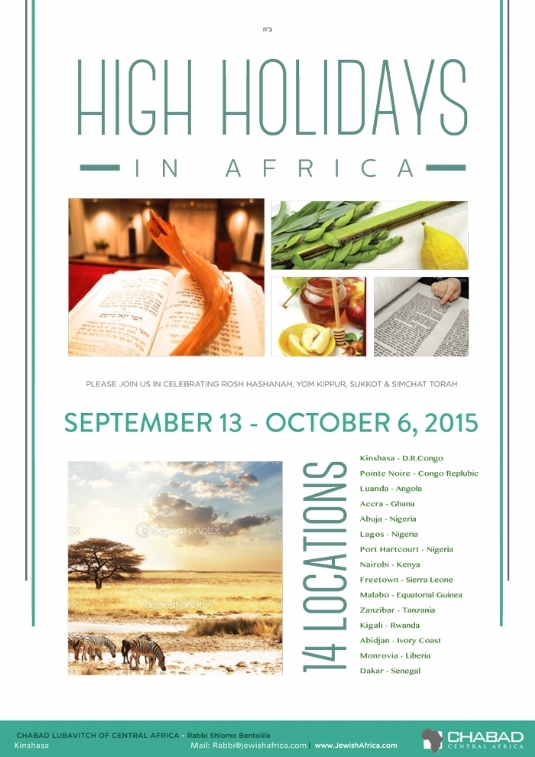 Chabad-Lubavitch of Central Africa , under the leadership of Rabbi Shlomo Bentolila , in cooperation with Chabad- Lubavitch World Headquarters , are dispatching groups of Rabbinical students to the Sub-Saharan African Region , to help organize the High Holidays programs and enhance the spirit of the ‘Jewish New Year’ amongst the Jewish residents, expatriates and visiting businessmen. The Student Rabbis will leave from Lubavitch Headquarters in New York City to visit the following cities and countries: The cities of Abuja**, Ibadan and Lagos* in Nigeria, Accra in Ghana, Luanda in Angola, Windhoek** in Namibia, Nairobi** in Kenya, Dar es Salaam in Tanzania, Malabo in Equatorial Guinea, and Freetown in Sierra Leone. Jewish residents in Benin, Bostwana, Burkino Faso, Burundi, Cameroon, Cote D’Ivoire, Ethiopia, Gabon, Gambia, Guinea, Liberia, Mali, Malawi, Rwanda, Sao Tome & Principe Islands, Senegal, Somalia, Togo, Uganda, Zambia and Zimbabwe looking to join and participate in one of the local programs, can contact Rabbi Bentolila at chabadafrica@gmail.com. 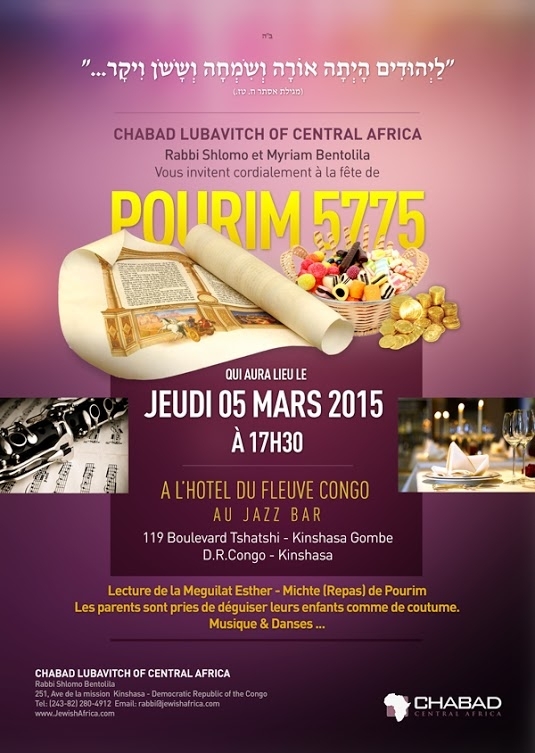 In Chabad of Central Africa’s Headquarters in Kinshasa the Democratic Republic of the Congo, the services and educational activities amongst young and adults will be held and conducted at the local Jewish Community Synagogue. *Services in Lagos, Nigeria will take place at the new and recently established Chabad Center under the leadership of Rabbi Israel Meir and Chaya Uzan. ** In communities such as Abuja, Windhoek and Nairobi, Chabad Lubavitch is working together with the local Jewish communities whose Synagogues will be open for the Rosh Hashana, Yom Kippur and Suckot holiday services. In the other and more distant Jewish communities, services and programs will take place at Hotels and various locations. Plans are underway to introduce all children to the art of making their own Shofar known as ‘The Shofar factory’ and to the various High Holiday customs and traditions. Community leaders, Israeli Ambassadors and other dignitaries will take an active part in the Prayer Services and Jewish Awareness programs.